“Meadowlark Landscape,” Print Available. ©2015 Garber Geektography. A gorgeous red clay road through the canola field. Print Available. An osprey we encountered at Richard B. Russell State Park. State Park is located on Lake Hartwell and within a short driving distance of several other state parks such as Richard B. Russell State Park, Victoria Bryant State Park, and Hart State Outdoor Recreation Area (two of which we visited). We enjoyed driving through the small towns dotting the area and taking pictures of the canola fields in bloom. We hopped over to Athens one day for lunch and stopped off at the outlet stores in Commerce on the way home, so there is plenty of variety in the area to explore. We didn’t see too many restaurants near the park, and everything seems to close up early, so be sure and pack your meals! Sunrise over Lake Hartwell. This location was about twenty steps from our campsite. Our campsite was a decent size, very level, and covered in gravel. We were right on the water, near a small cove for boats, canoes, and jet skis. The view was beautiful and it was very peaceful to listen to the water as we relaxed in the shade. We both agreed it would have been more fun to be there with a boat or kayak, but the view was nice and we were able to walk along the beach, and the dogs had fun getting muddy. We didn’t fish or try the water or the pool—too cold—but it looked like all of the kids were having fun! We had a fire pit, concrete picnic table, water and electric hook-ups, and a nice, clean comfort facility just steps away. And we loved having a pull-though site! Sunset near the amphitheater, a short walk from our campsite. The roads to the camp sites were more narrow and uneven than we had experienced before, and this campground was both larger and more crowded than our last experience, but we did arrive at the tail end of Spring Break. There were a lot of kids and families there, but it was a fun, friendly experience overall. My only complaint would be the ENORMOUS light our neighbors left on all night (the same neighbors who played the radio well after quiet hours). Some friends of ours camped there the same weekend and their grandson had a ball playing with the other kids, swimming, etc. We saw plenty of dogs, kids whizzing by on bikes, and boats making waves in the lake. It would not be the place I would recommend for peace and quiet, or nice long hikes, but it was a fun getaway and the landscape in the area is beautiful. As we were driving up I-85 to our faculty retreat at Lake Hartwell, we kept seeing these beautiful yellow fields in the distance and instantly wanted to know what they were. We saw a couple up close and found out that my guess of canola was on target. This was the first close-up of a field we got. We loved the red barn in the background. The stalks were about 4-5 feet tall, so I had to use my tripod as a monopod to get some extra height. The dramatic sky cooperated, too. Print Available. After having a wonderful dinner, we rushed to Watson Mill Bridge for sunset. But even in our hurry, we couldn’t pass up this Georgia red clay road bisecting these canola fields during golden hour. Michelle insisted I stop, and I think this is my favorite photo from the trip. Print Available. Botany Bay? Botany Bay! … Oh no! On our first trip in the camper to Edisto Beach, SC, Michelle mentioned going to Botany Bay Plantation. I knew I had heard that name somewhere before, and I kept racking my brain to figure it out. Turns out, that SS Botany Bay is the name of Kahn’s ship in Star Trek II: The Wrath of Kahn (and later in Star Trek: Into Darkness). Of course that name came from the original Botany Bay in Australia, which was a penal colony. After discovering the geeky nature of my recollection, I repeatedly quoted this line from Pavel Chekov when he discovers the identity of the mysterious marooned ship. When Michelle showed me pictures of the old trees on the beach, I couldn’t wait to get there to capture the sunrise. Of course, the weather didn’t cooperate very well … or maybe it did. A dense layer of fog blanketed the sun. This gave a certain mystical and lonely quality to the shots that I had not anticipated, but that I thoroughly enjoyed. The fog was like a giant softbox, giving even lighting over the trees and lightly shrouding the other objects in a distance. This really helped me isolate my subjects and also gave me an interesting canvas in the background to use various processing techniques and textures. I processed all of the following shots with a combination of MacPhun’s Tonality Pro and Karen Hutton‘s and Tanya Wallis’ forthcoming texture pack. We have several more images from the Botany Bay Plantation shoot on the way, but I am grouping them in different blog posts. The area has so many types of landscapes: bogs, marshes, ponds, streams, dense forest, farmland, and beaches. It really was a great place to practice a variety of landscape and nature shots. This was one of my telephoto images with the a6000. I used a basic black and white conversion in Tonality Pro and added the Bursty Blur texture from the texture pack. Print Available. i had some fun with the wide angle distortion on this one! I liked the effect that the Sandy Cool texture had on it. It seemed to fit the beach theme. Print Available. I went for a Ceti Alpha 5 look to this one, with the reddish goodness. To add texture, I used “Face it – Scratched” from the texture pack. Print Available. Since I saw the name “Alien Skin Burn” in the texture pack, I’ve always wanted to use it. It seemed to fit the mood of this photo well. Print Available. After the split tone processing in Tonality Pro, I added the “Cold Skin” texture to this photo. It enhanced the blue tones and added a cool vignette. Print Available. One of my favorite split-tone presets in Tonality Pro is “Blue Morning.” Split-toning involves taking a black and white image and adding two different tints to the shadows and the highlights. In this case, the shadows get a blue tint, and the highlights get a golden tint. I decided not to use a texture on this one because I liked the contrast between the textured ocean and the smooth sky. Print Available. 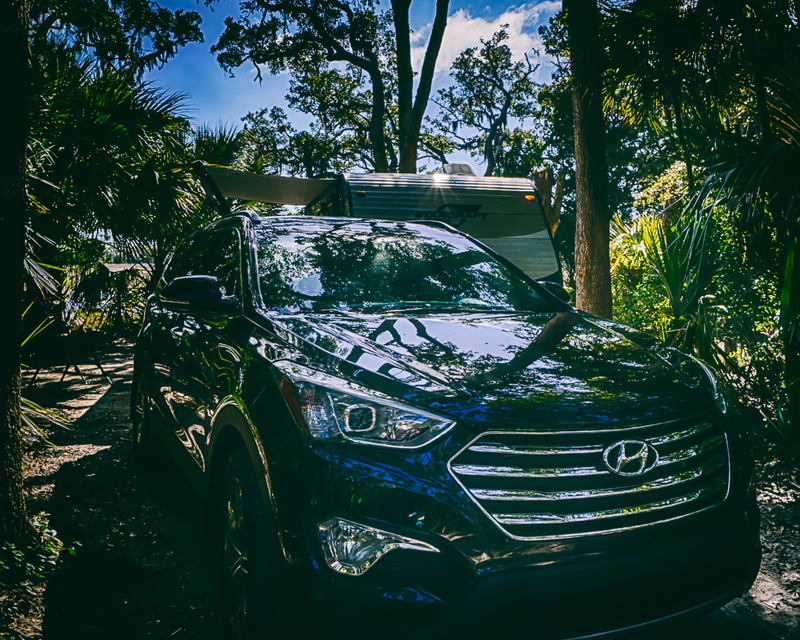 The Tumbler in front of Rogue Shadow at our inaugural campground at Edisto Beach State Park, South Carolina. My parents may have Willie Nelson’s “On the Road Again,” but we have Metallica’s “Wherever I May Roam” (though Michelle prefers this version by Iron Horse). We are now introducing Phase 2 of the Garber Geektography project! One of the things I learned from my time in The Arcanum was my penchant for travel photography. I had a lot of opportunities last year for travel experiences, and while I have a few trips lined up this year, we are mostly sticking a little closer to home. The galley of the Rogue Shadow. Perfect for the two of us. 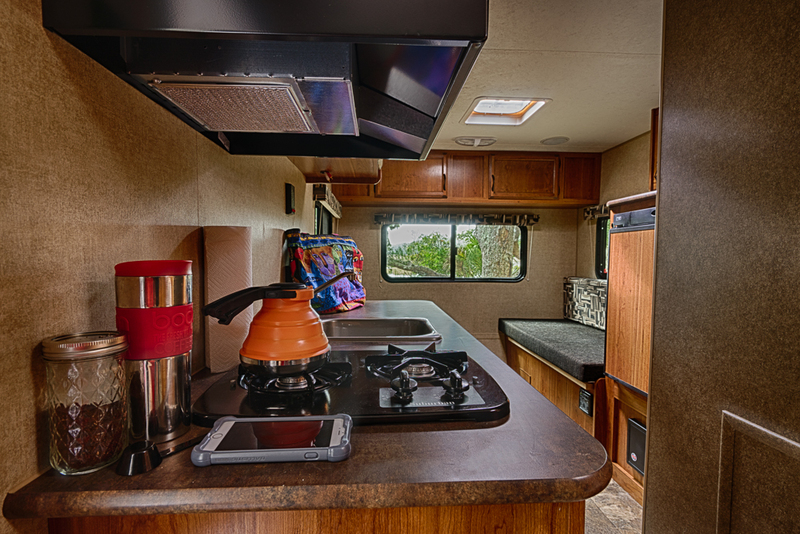 As we were trying to figure out how to incorporate a travel mentality into our lives, Michelle and I downsized to one car–appropriately named The Tumbler because it came in black–in anticipation of buying a camper that would allow us more freedom. The galley and the bed area. We have a queen size bed at home, and the dogs sleep in their own beds. In the full size bed in the camper, they opted to sleep in the bed. Go figure. 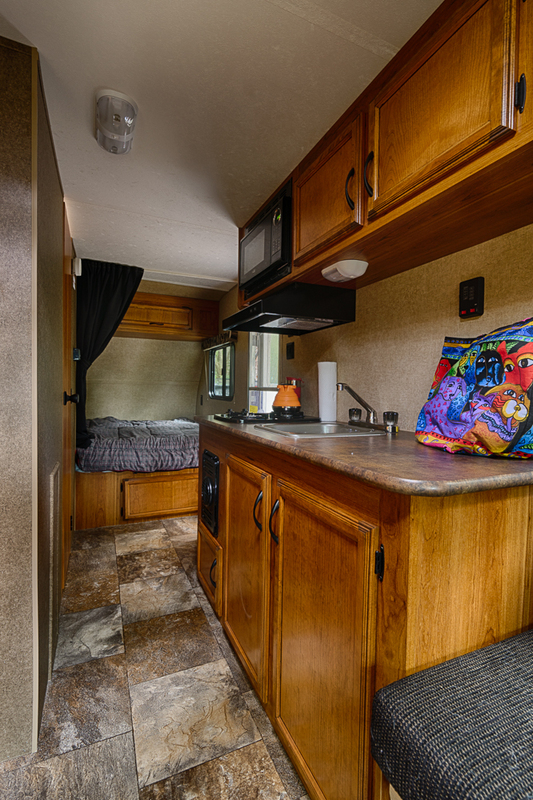 We spent the better part of a year researching different camper options and planning. We finally decided to go with a small travel trailer—the bathroom sold it for us! We’ve dubbed it the Rogue Shadow and are going with a Star Wars décor. It is a Starcraft Camper, after all. By the way, Rogue Shadow is the name of Starkiller‘s personal transport. Starkiller, A.K.A. Galen Marek, was Darth Vader’s secret apprentice. Seriously, you can look it up in Wookiepedia!). We are ready for the adventures before us! We’ll be posting reviews of the locations we explore, as well as updates on our (mis)adventures as camper newbies. Part 2 of our phase 2 project is coming soon, so stay tuned! Our first campsite spoiled us! It was spacious, with trees all around, and a great view of the salt marsh in the Live Oak Campground at the Edisto Beach State Park in South Carolina.